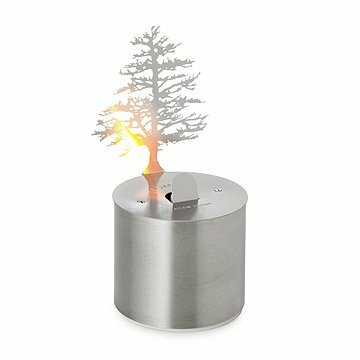 Adam Frank's flameless candle casts an enchanting shadow from a tiny, stainless steel pine tree. A new, LED-illuminated variation on Brooklyn-based artist Adam Frank's original Lumen Oil Candle Shadow Projectors, this battery-powered flameless candle casts an enchanting shadow from a tiny, stainless steel pine tree. The shadow's intensity and size will be affected by additional light in the room – the darker the room, the more dramatic the results. The Lumen's built-in LED light source is both long-lasting and energy-efficient while a single set of batteries (not included) will last for approximately six months of daily use. Made in Brooklyn, New York. 6" H x 3" Dia base. Requires 4 AA batteries, not included. One set of batteries will last for approximately 6 months of daily use. Bought one each for my daughter and sister-in-law as Christmas gifts. So dissapointed. Image on web site appears larger than what you actually see. Very small shadow. wick not adjustable although this might have helped. Some photos show a light reflector, this would have been very helpful as well, I couldn't find one in the box nor was it attached to the tree part. For the most part Uncommon goods has had exceptional products and service. They fell short on this one. Do NOT buy. Wish it generated more light. If the room is not almost completely dark it doesn't generate much of a shadow. And who sits in an almost completely dark room? I was a little disappointed because the shadow cast was not as large as it appeared in the pictures and video. My daughter-in-law loved it!! It will work nicely for a night light or just for ambiance. You definitely have to have a very dark room. Any other light really over rides the shadow cast by the lamp. My daughter saw this advertised and wanted it for her birthday. We ordered it and it came promptly. Last night we gave it to her and she was delighted. The LED product would still make money at $15-20 and could have more uses if it were brighter. My friend loves anything that lights up, shines...and this is definitely perfect! Perfect holiday gift! & I love to give gifts that were made in Brooklyn! I bought this as a lovely little addition to my holiday decor to bring a warm holiday glow into my home. It's so beautiful I think I will use it year round! This is the most lovely night light ever! battery operated & has a timer!